Anaheim, CA March 6, 2014 – Vega, the leader in clean plant-based nutrition, announced a new bar family today at Natural Products Expo West. Bursting with whole food ingredients, the new Vega Bar family includes a brand new bar addition, fresh new recipes and exciting flavor profiles to satisfy all taste buds. The full Vega Bar family provides clean answers for daily needs– from morning meal, to satisfying mid-day snack, to mid-workout fuel and post-workout protein. 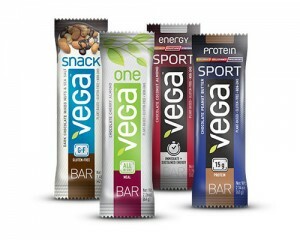 Vega Snack Bar (new!) Manage the mid-day munchies with a mouthwatering, plant-based Vega Snack Bar. Stock your bag or desk drawer for strategic snacking with five delicious flavors of a whole food bar you can feel good about. Superfood ingredients in Vega Snack Bar fill this gluten-free, get-you-through-to-the-next-meal morsel with satisfying protein and 1 gram of Omega-3. Vega One Meal Bar (new recipe) Indulge and relax knowing you’ve covered your nutritional bases with Vega One All-in-One Meal Bar, packed with protein, fiber, Omega-3s, plus vitamins, minerals, antioxidants, probiotics and greens. Vega Sport Bar (new recipe) Give your muscles the protein they crave. Vega Sport Protein Bar supports you post-workout with 15 grams complete, multisource, plant-based protein, plus 2.5 grams BCAAs and 2 grams glutamine your body needs. Vega Sport Energy Bar (new name, new recipe) Don’t let a lack of fuel stand between you and the finish line. Moist and delicious, plant-based Vega Sport Energy Bar gives you fast-acting, long-lasting, whole food energy to help you go the distance. Vega’s new bar family launches nationwide April 2014. The bars will be made available at grocery, natural food and specialty retail stores across North America. The bars will also be available online at Vega’s webstore. Since 2001, Vega (previously Sequel Naturals) has established itself as the leader in the plant-based natural health and performance products industry. Formulated by Brendan Brazier, vegan former professional Ironman triathlete and bestselling author on plant-based nutrition, the Vega brand of nutritional products is internationally recognized. Good for your body and the planet, Vega is the clean, plant-based choice to fuel your healthy, active lifestyle—without compromise. For more information, please visit myvega.com, join Vega on Facebook at facebook.com/vegafanpage and on Twitter @VegaTeam.